Personalize your AHPS Library experience, allowing us to deliver specific content to your own personal home page, called your "Dashboard". Send you your membership materials and License Plate. We ask that you give your real name. Given the copyright restrictions it is imperative that you give your real name to identify yourself. You will also be able to choose a "user name" which does not have to have any relationship to your real name. Your user name will be visible all the time, but your real name will only be available in your Profile. We ask for your correct e-mail. Like any other community, we expect to communicate with you, not spam you. Your e-mail will only be used to send you our newsletter "No Limits" and the Wild About Cars Blog and to contact you on Society matters. The e-mail feature also allows single member-to-member "PM" communication, much like what is found on most forums. We ask you to give us your mailing address. 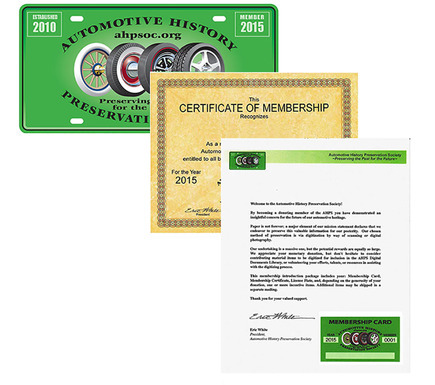 Members will receive a Society License Plate, Membership Card and Membership Certificate—and we will need your address to mail these items to you.